Tess studied at Chelsea College of Art, and graduated from Goldsmiths College, London, with a BA Hons in Fine Art. She has exhibited widely in the UK and Europe, and has twice been selected for the BP Portrait Award at the National Portrait Gallery. Her portraits can be found in permanent collections in many universities around the country. Tess is a Fellow of the Royal Society of the Arts. Commissioning a portrait is about celebrating a time in a person's life. 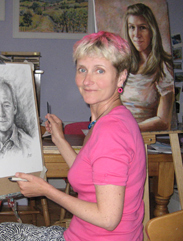 People often choose to commission a portrait to mark a special occasion, perhaps a certain birthday, or to honour a friend, oneself, a relative or colleague. The pleasure that is so obvious when the subject sees the picture take shape is a wonder to behold, and, of course, the final painting is worth so much more in its personal content than any other image could ever be.